Huy Nguyen, a second-year Computing Science and Information Systems student – and one of many international students registered in Co-operative Education – just landed his dream placement. 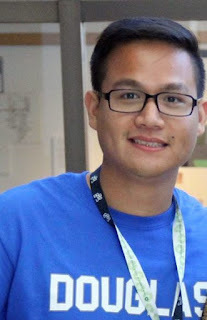 From January to August, Huy will be putting his skills and knowledge to work in the City of Edmonton’s Information Technology Department while gaining valuable hands-on experience with one of the city’s largest employers. Congratulations, Huy! Bonus: Two Douglas students, Caitlyn S. and Veronica Z., are earning while learning. Both landed part-time jobs after working with Student Employment Centre staff to boost their resumes and interview skills. They were hired for customer service positions in the retail sector – great opportunities to build their communications and networking skills while earning money to pay tuition. Congratulations to both! In the last month, 58 new employers registered with the Student Employment Centre to post part-time, full-time and volunteer opportunities. Since the last newsletter, 85 new students registered to access SEC services, including the job board. Over 120 new jobs were added to the job board and of these new postings, more than half are full-time, off-campus opportunities – perfect for alumni. Administrative Professional - Macdonald, Shymko & Company Ltd.
PepsiCo is one of the world’s leading food and beverage companies, and they are looking for potential employees like you. There are several local openings, including weekend account merchandiser, warehouse coordinator, merchandiser and raw materials coordinator. Visit PepsiCo Careers for more information. Nov. 22 – Meet the Pros: Invest in Your Future - TD Canada Trust will be at the New Westminster Campus in the Aboriginal Gathering Place [add room number]at 5pm to talk about current openings and career options at the bank. Register: co-op@douglascollege.ca. Vivint and University First Class Painters were on campus recently promoting summer positions for sales representative and business operator, respectively. If you missed these sessions and are interested in these job opportunities, contact Barb at the Student Employment Centre at 604 527 5890. Register with the Student Employment Centre now and be the first to know when employers are coming to campus, or to receive job alerts for off-campus work opportunities posted on our job board. Follow Douglas College on Twitter to receive our weekly Hot Job tweet!